When Apple announced a special event for March 9th, many people immediately concluded that it must be related to the smartwatch the tech giant debuted last year. The suspicion seemed to be confirmed when Apple named the event “Spring Forward”. And the audience was not disappointed. 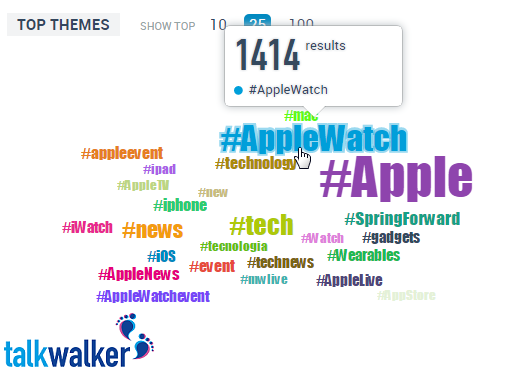 The hashtag cloud for the 30 days leading up to the event shows that many online users already expected the Apple Watch to play a major role. 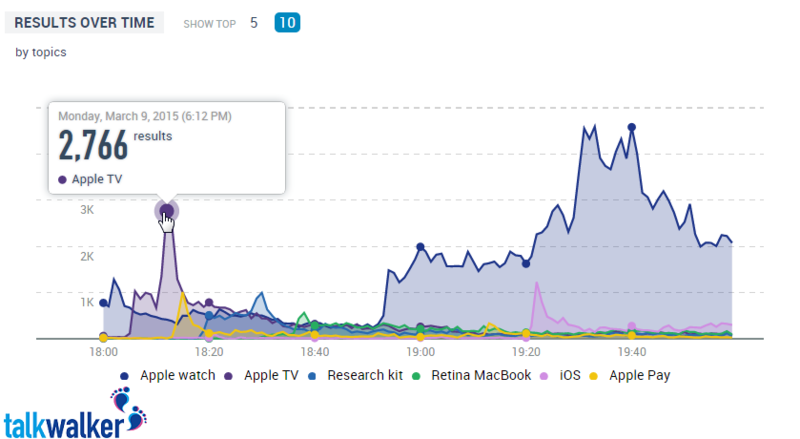 The buzz for Apple and its watch kept increasing steadily throughout the day. When Apple CEO Tim Cook finally took the stage at 10am local time (reflected as 6pm CET here), mentions for the watch were already at 20,000 per hour. After Cook extensively talked about new features it will include, mentions climbed to more than 150,000. The increasing buzz towards the event’s kick-off. 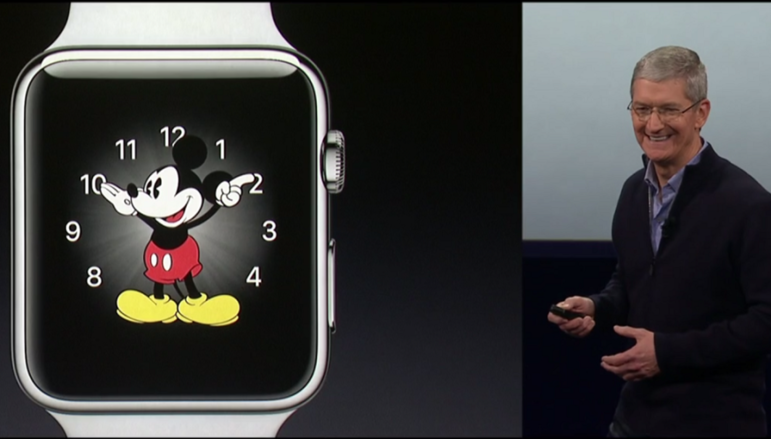 But there was more to the event than just the new Apple watch. Cook kicked off by talking about new record in sales and the company’s new flagship store in China. But the audience was more interested in what came next: Cook was followed by Richard Plepler, CEO of HBO, who announced an exclusive partnership with Apple. A new stand-alone streaming service will be made available shortly for Apple TV users, just in time for the season premiere of the channel’s hit series “Game of Thrones”. The online public reacted to those and the other product-related news of the day immediately. A minute-by-minute breakdown of the conversation for the different products that were the focus of the event. The Spring Forward event caused attention all over the world. Since it was held in San Francisco and attended by many high-profile journalists who wrote about it, it’s no surprise that much of the conversation came straight from the US. But other countries were not too far behind, which reflects Apple’s position as one of the key players in the tech market. Over the course of the day, the Spring Forward event gained more than 15,000 mentions in the United States alone. But the focus of the overall conversation – just like during Spring Forward itself – was definitely the Apple Watch, which gained significant attention in most countries over the course of the day. With Apple’s latest wearable gadget being the focus of yesterday’s event, how was this new product taken by the public? A look at the sentiment shows that opinions are split nearly evenly between positive and negative, but the positive voices win by a margin. 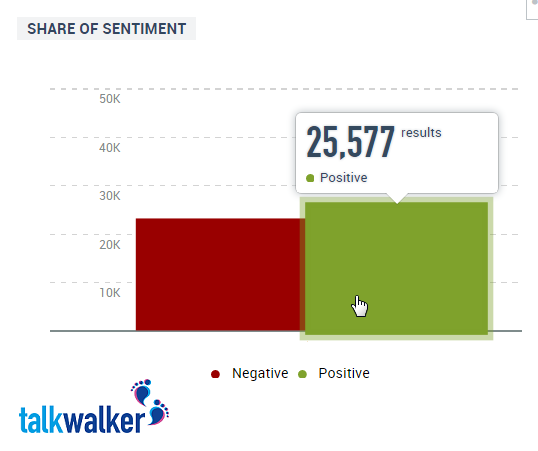 Positive and negative sentiment for the Apple Watch are split almost evenly. With around 23,000 negative and 25,000 positive mentions for the watch during Spring Forward alone, it’s hard to make out a clear winner. Among the positive emotions, there’s for example the watch’s battery life, which allows for a full day of use before it needs to be recharged, as well as the integration into some of Apple’s newly-launched health apps. On the negative side, many criticize the cost of the device. The high-end version will set buyers back at least 10,000 dollars. Critics say while spending that amount on a watch may be an investment, that does not hold true for the little computer on your wrist, which is likely to be outdated in just a few years. Other criticism includes the fact the many of the features introduced with the new Apple Watch are already available on other smartwatches, often for a fraction of the price. While the overall event was a success for Apple and, as usual, created much buzz around the company and its new products, it remains to be seen how popular these devices will be once they hit stores.